1. Heat oil in 6 quart Dutch oven. 2. Add chicken a few pieces at a time, Brown well on all sides. Remove as browned. 3. 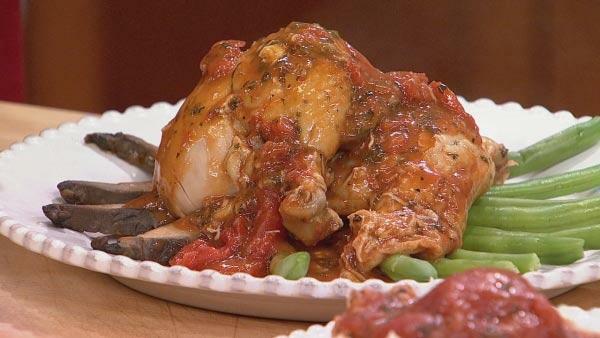 Return chicken to Dutch oven; add tomato sauce and whole tomatoes, wine and all spices. 4. Simmer uncovered 45 to 50 minutes, until chicken is tender. 5. Combine flour and 3 tbl water, mix and stir into sauce. Add mushrooms and cook on low for 10 minutes. 6. Cool, Cover and refrigerate over night. 7. Serve the next day, reheat over low heat. 8. *Skim off any fat on top of pot. 9. ** Serve with fresh blanched green beans.